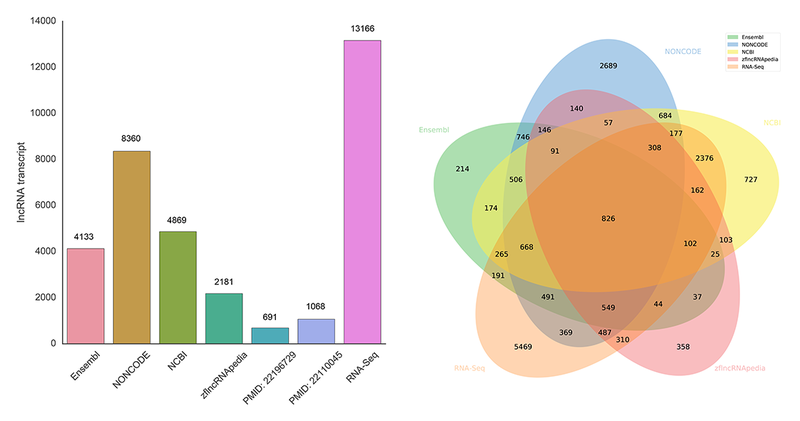 We obtained 7394 zebrafish lncRNA genes (13166 transcripts) from RNA-Seq data analysis, and then integrated them with those from Ensembl, NONCODE, NCBI, zflncRNApedia and literature. Our final zebrafish lncRNA set contains 13604 lncRNA genes (21128 transcripts). The distribution of zebrafish lncRNA is relatively uniform on chromosome, about 10 lncRNA genes per M sequence. The Intergenic, Antisense, Sense Overlapping are 51%, 42%, and 7% respectively, in zebrafish lncRNA. Generally, among all the transcripts, those with single exon should be the most, which are most likely false positive due to the transcription noise. Therefore, we made a very strict screening for those transcripts with single exon, in order to discover more authentic isoforms of lncRNA. The quantitative analysis of zebrafish coding gene and lncRNA was performed, and the correlation coefficients between coding gene and lncRNA were obtained, and then the co-expression network concerned about both coding-gene and lncRNA was constructed. 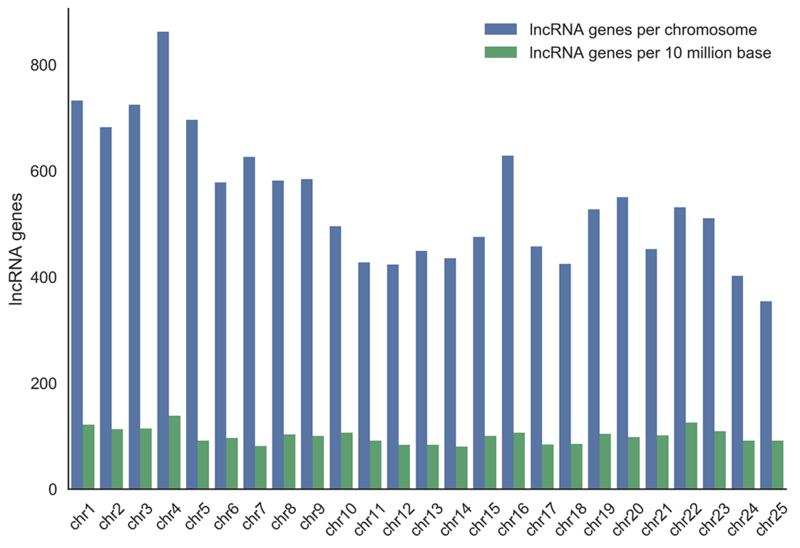 The correlation coefficients between coding genes, between coding gene and lncRNA, and between lncRNAs are descending, successively. Gene ontology (GO) is a major bioinformatics initiative to unify the representation of gene and gene product attributes across all species. GO has been proven to be very useful for understanding the function of a gene. 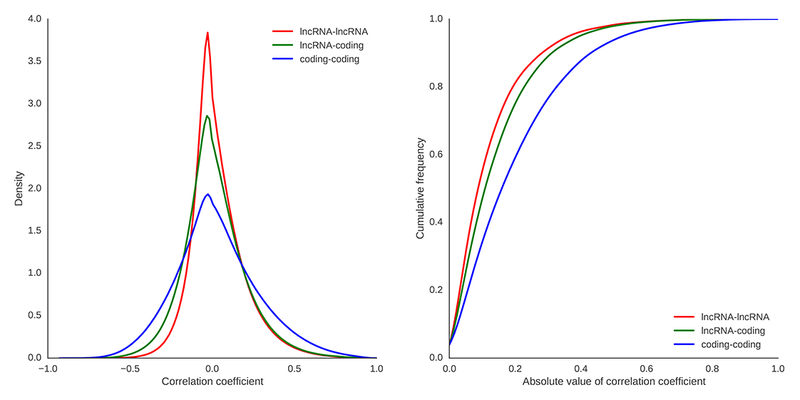 Gene network can be used to reconstruct and improve GO, and to predict the function of lncRNA. In order to understand the function of zebrafish lncRNA, we performed GO analysis according to the co-expression network between coding and lncRNA gene. 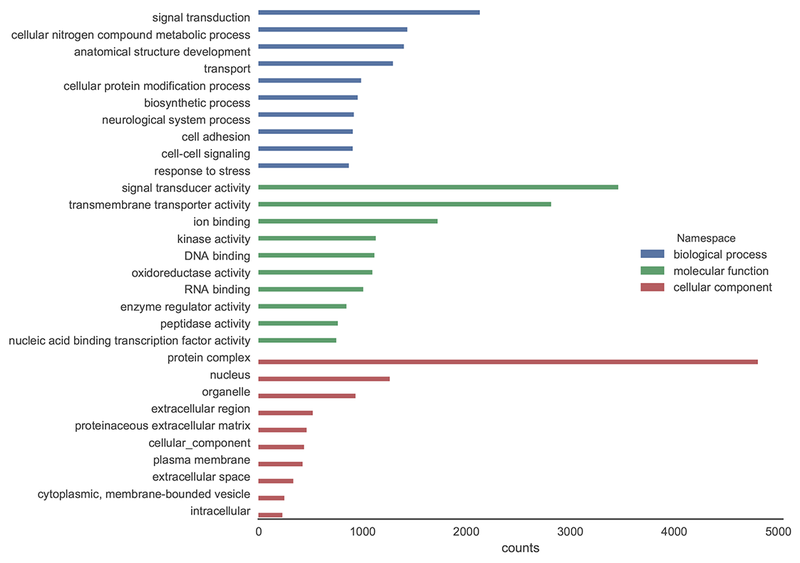 In this way, 7521 zebrafish lncRNA genes have GO annotations.